Today in school we celebrate Children in Need. 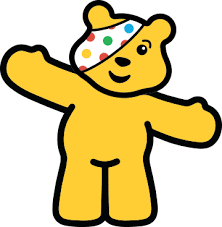 Pupils are welcome to come to school in non-uniform for a small donation of £1 (Pudsey Bear themed outfits are of course welcomed but are in no way essential). Our Year 6 pupils will once again host their annual 'Children in Need Fair' to raise further monies for a very important cause.